Ah, High Mountain Brewing, inside the Brewhouse at Whistler, part of the Mark James Group. So many names, and yet so little to motivate us to drink there. Close your eyes, and imagine a brewpub: open your eyes and you’re on the massive patio at the Whistler Brewhouse. A hallmark of everything basic that the tourism trap part of Whistler represents – hard to put into words, but easy to picture – this Brewery has all the space in the world visitors that walk by, perhaps ones that tried to get into a better bar and failed because they were full. website to realize they hadn’t changed their tap list since 2013. Part of our mission is to give breweries a chance to improve over the years, to see them evolve. But if they don’t change their tap list over 5 years, what exactly is the point? 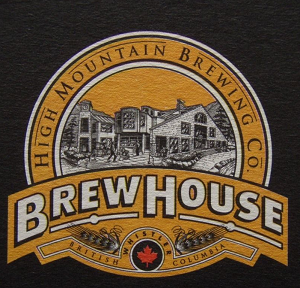 The point of course, is that High Mountain, just like Yaletown Brewing and Big Ridge Brewing, is a low-risk means to an end: in-house beer that’s just enough better than Molson and Heineken, for customers that are there first and foremost to have a good time. Which is fine, as far as a business model works. It’s just not where you should go for beer.